Grand Cayman Dolphin Program is very convenient for cruise ship passengers and island guests alike. This Caribbean jewel is very affluent, clean and still has a wonderful island feel about it. The Dolphin facility is only 15 minutes from Georgetown and across the road from the Turtle Farm. 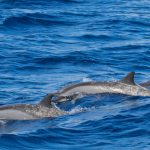 If you are short on time or have plenty of time, you can come play and have fun with the dolphins in a few hours and still have time to explore more of this wonderful island. 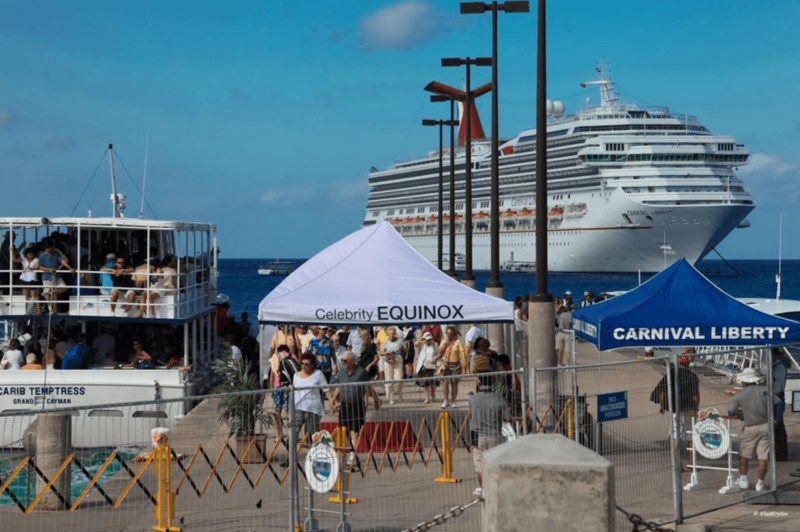 Many guests that come to Grand Cayman arrive by Cruise Ship. If you are one these guests, you need to remember a few things. The program times you pick are based on Island time, not ship time. So if you are leaving from a ship from the Eastern ports, like Miami or Ft Lauderdale, Grand Cayman time is 1 hour behind the ships time. Transportation – There are plenty of taxis from the Cruise port to take you to the Dolphin Facility across the street from the turtle farm. Important: make sure to tell the taxi driver you are going to the facility across the street from the turtle farm. There is another dolphin facility on the island and you don’t want to go to the wrong place. The Cruise Ship in Grand Cayman docks off shore and you will need to take a tender (small transportation boat) from your ship to the shore’s dock in Georgetown. So plan on travel time back and forth to your ship. There are usually lines to get back on the tender to go back to your ship. Take a taxi to Dolphin facility, that is located at the West Bay Road, across the street from Turtle Farm and approximately 15 minutes from George Town. West Bay taxis from downtown cost approximately $20 Grand Cayman Dollars. If you are going to participate in one of the dolphin programs in Grand Cayman and you are wondering what will happen with the rest of your day, don’t worry anymore because you can do something before or after your dolphin program. You will have the opportunity to enjoy another one of Cayman’s top activities: the Turtle Farm in Boatswain’s Park. The entrance for the Turtle Farm starts from $18 and you can enjoy the rest of Boatswain’s park. Seize your day at one of the Caribbean must-see places, it is worth it and it is walking distance for the dolphin facility! Seven Mile Beach is a long crescent of coral-sand beach on the western end of Grand Cayman island. Seven Mile Beach is known for its beauty, recently receiving the honor of “The Caribbean’s Best Beach” from Caribbean Travel and Life Magazine. This beach is near Georgetown, so you will need to taxi or bus to get to it. If you just want to relax and try some cool beverages and have some great local cuisine, the Cracked Conch restaurant has beautiful views of the ocean and outside seating is walking distance too. 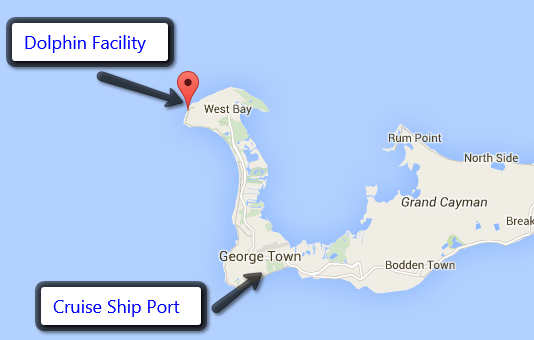 How far is Dolphin Facility in Grand Cayman from George Town? The dolphinarium is about 10 km from George Town or about 20 or 30 minutes. How much will I have to pay for a taxi ride from George Town to Dolphin Discovery Grand Cayman? The ride is about $20 dollars. If there are more than 4 passengers, the taxi will charge a fixed rate per person. Is there any other transport with a lower rate to get to Dolphin Facility in Grand Cayman? Yes. Grand Cayman has 2 bus routes that will take you to our dolphinarium with a rate of about $2 USD. You can take one of the direct routes from the adjacent corner of the Public Library Edward St. located in George Town downtown. Do you have showers to use after my swim with the Dolphins program in Grand Cayman? Yes we do! Showers are located outside by the locker area. We advise you to take a towel as they are not provided at the facility. Where may I leave my belongings while at Dolphin Facility in Grand Cayman? At Dolphin Discovery, we have lockers available for use during your time in the water. We require a small deposit for the key that will be returned when you return the key. Can a friend/relative go with me to watch my dolphin program in Grand Cayman? Sure. In fact, if you and your friends want to swim or snorkel before your program, the Turtle Farm offers a swimming pool for an additional $10 dollar fee for unlimited time. Is there a beach near the Grand Cayman Dolphinarium? Yes. Seven Mile Beach is the most famous beach of Grand Cayman and is only 2 km. from the Dolphinarium. What happens if there is bad weather in Grand Cayman? Due to our strategic location we are fortunate to be able to work under any climatic condition. However, it is possible that your ferry arrives to another dock, a little farther down the coast.